The Flames return home after a disastrous – in the standings – road trip tonight as they host the New York Rangers for their 33rd game of the 2014-15 season. Calgary (17-13-2) has lost five in a row, including all four games of their recent road swing. Despite that, the mood was somewhat upbeat at the rink yesterday. Why? The team recognizes that they’ve largely been playing well and it’s been circumstances and some untimely gaffes on their part that has triggered this slide. The key to victory, for the home side, is paying attention to the little things in the game – especially consistency in defensive coverage. New York (14-10-4) are headed in the opposite direction, having won three straight – including whuppin’ the Vancouver Canucks on Saturday night in Vancouver. They’re hoping to keep their momentum going as they recover from a slow start that’s put them a bit behind in the NHL’s Metropolitan Division. Puck drop is at 7pm and you can catch it on Sportsnet Flames and Sportsnet 960 The Fan. Per Pat Steinberg, sounds like it’s a coin-toss between Raymond and Brandon Bollig for the fourth line wing spot and it’ll be a game-time decision. Raymond hasn’t been stellar since returning, so I guess that makes sense. 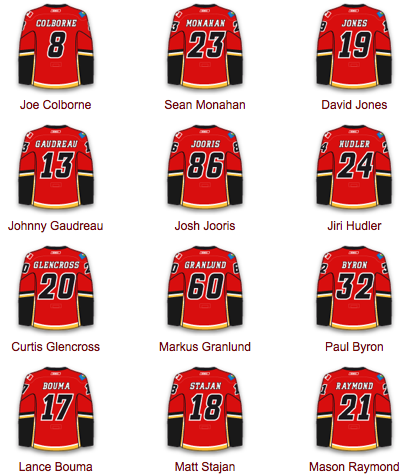 Corey Potter and Brian McGrattan are the other scratches. 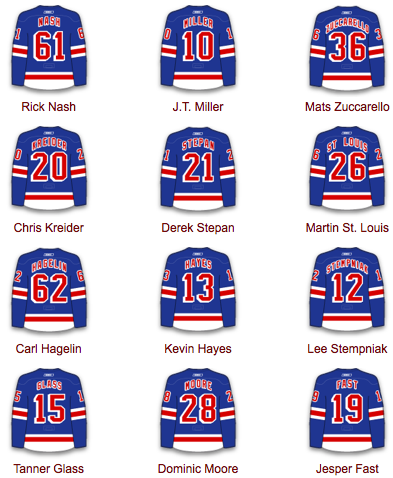 No changes are anticipated in the Rangers’ line-up, which means Lee Stempniak returns to town (yay!) and handsome Henrik Lundqvist, considered the NHL’s dreamiest goalie by a poll of people I saw on Twitter this morning, gets the start. The Ranges have what I like to call – balance. They have good defensive depth. They have three solid lines and some stuff with useful potential on their fourth line. 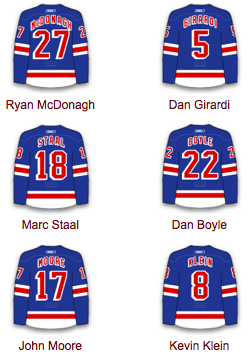 Heck, they have uber-prospect Kevin Hayes AND a Rick Nash that remembered how to score hockey goals. All in all, the Rangers are another tough test for Calgary: a talented team with scoring depth and a really good goalie. There are no easy outs in the NHL, and the Rangers are definitely not an easy out. The Flames will need to use smart match-ups and work their tails off tonight to get back in the win column. If they slack in any way, there’s a good chance they could run their losing string to six. Arguably the difference in this game was the goaltending..Kari (UFA) Ramo pack your bags you are otta here! 4 goals on 13 shots…..no arguments here. Ortio, come on up! Wow. This team has no confidence left. That was a bad hockey game. With the exception of Stajan,Raymond,Colborne coming back off the IR, what the hell has changed? Guys aren’t shooting at double or more their career shooting rate anymore and Hiller/Ramo aren’t still sacrificing virgins to whatever volcano Domenic Hasek sacrificed them? One crossbar, 2 posts, 2 Kevin Klein sweeps off of the goal line. I wonder what happens now, changes? not likely. Another game where Calgary outshoots their opponents = sixth straight loss. Getting crap shots from the outside after being down 4-0 doesn’t mean we outplayed the other team. Its all about how you play at 0-0. Flames are showing their true colours right now. We’ll be lucky to be in 13th in the west by the end of the year. When you spot the other team two, it’s tough. The answer is probably in the middle. Tough to say how that one would have gone without the bounces. Nothing. We wait. No need to be rash. We aren’t winning the cup this year. Just evaluate the players, evaluate coaching staff, etc. Stick to the plan, trade some vets if opportunity presents. This fall from grace is not a bad thing. Right before this 6 game skid MGMT was talking a big game about spending to the cap. This is still a rebuild year, fans have gotten off easy so far but rebuild years are ugly and are suppose to be hard to follow. Pushing for playoffs could have really hurt this team long run. I’m not saying playoffs won’t happen, but let things run its course. I was at the game, and territorially, the Flames deserved a better fate. Per War on Ice the Flames had a 63% corsi for at 5 on 5. This team is still growing, still learning, but despite the last few loses (minus, the Chicago game), there are some good signs. 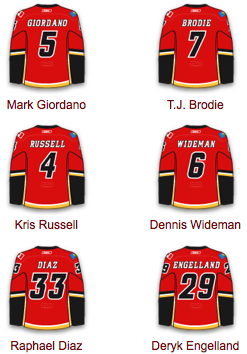 Also, Colborne looked good, Johnny looked good, and (I can’t believe I’m about to say this…) Engelland looked good. The issue tonight was quite simply some bad lapses in defensive coverage that were exploited by the puck hoping over a stick or an intercepted pass – assuming the game plan wasn’t ‘give Nash as many breakaways and odd-man rushes as you possibly can’. In short, this team just needs to play a bit more cohesively so they don’t get burned by breakdowns, but unfortunately that happens more often when you start pressing. This is the regression we were all bracing for (a shooting percentage of ~4% in the six loses), so we can’t be overly surprised. You didn’t mention Kari Ramo…how did he look?? Thanks for coming out though. Scrivens, Fasth??? Did they play in tonights game?